You had a VERY outlandish year! What fun! I had completely forgotten about the Warriors Anthology, thankfully your post has reminded me and it's now on my TBR list. I also attended the Grandfather Mountain Highland Games this year and had such a great time (despite getting drenched! )that I plan on going again. 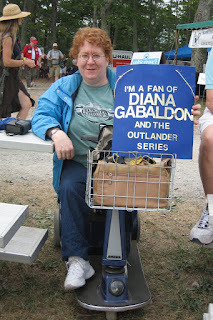 I was new to the Outlander blogging community at the time (but was on the lookout for any obvious Outlander fans-can't believe I missed you and your sign! ), but I'll look for you next year and say hello! If you're a Lord John fan, I think you'll enjoy "Custom of the Army". A very entertaining story. I hope to go back to GFM next year. It was a lot of fun. Ironically enough, although I knew more than a dozen people (mostly from LOL) who were going to be there last year, I never did manage to meet up with any of them. Had a great time talking to various OUTLANDER fans in the crowd, though!